Kindly note that we no longer support Revolution slider which means that the RS file (slider exported are not compatible with the latest version). This plugin is only supported in the previous version of DirectoryEngine. After your purchase, if you want to use Revolution Slider please contact our customer support to support@enginethemes.com for more information. In case you don’t want to use the “ Video background” for your home page. You can use the Revolution Slider to make it look like “Homepage 2”, “Homepage 3” in our demo site. Choose Plugins → Activate the plugin. 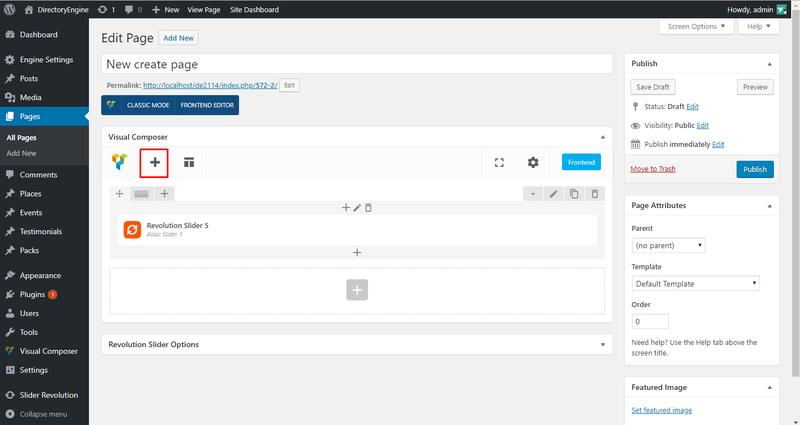 Then you’ll find the plugin in your admin panel. 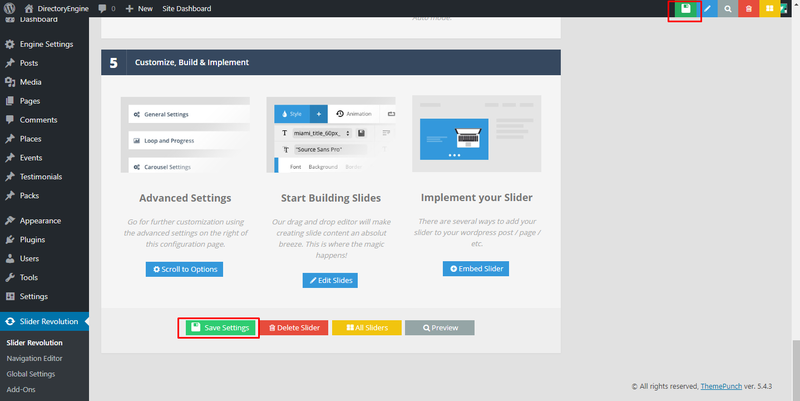 We provide the default slider so that you can set it up similar to our demo site. 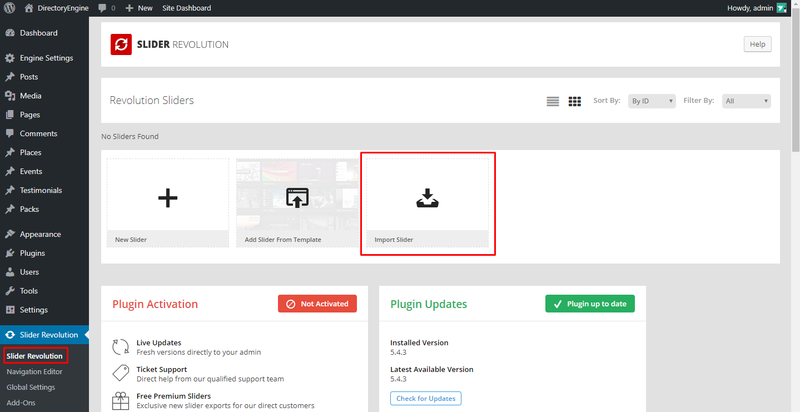 Visit the Revolution Slider section, you can find an " Import slider" button, click on it and you can upload the default slider. You can also create a new slider based on your need. 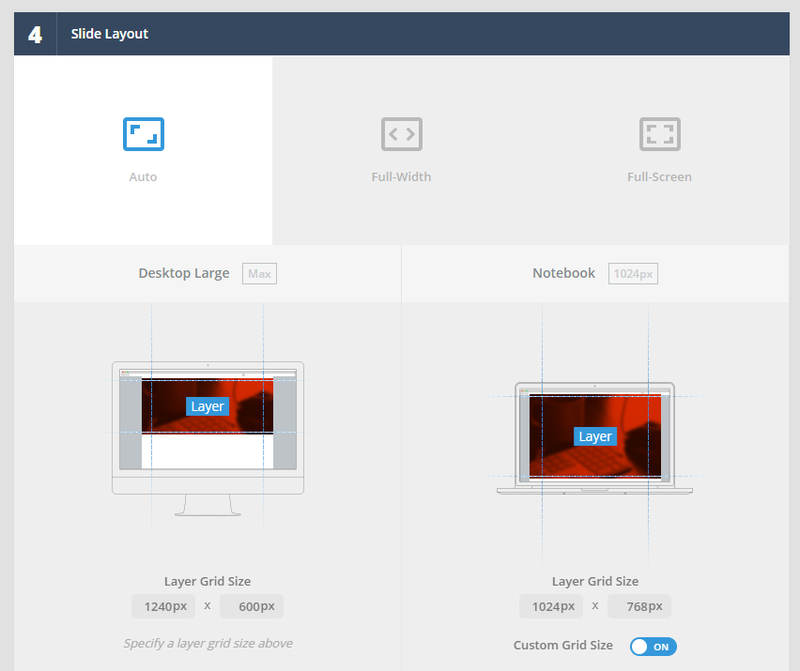 To create a new slide, hover your mouse over the “ New Slider” box. 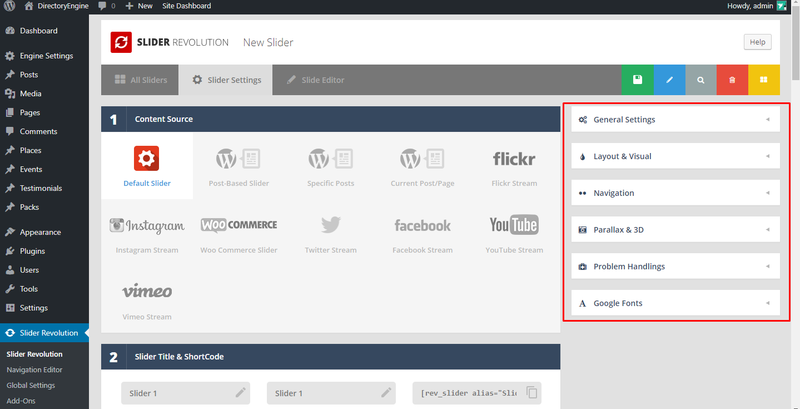 There are several new content sources that can be used for Slider Revolution, including Instagram, Facebook, Woocommerce, etc. You should select the suitable one for your site. All the blanks in this section MUST be completed while other sections such as Content Source, Select a Slider Type, and Slider Layout can be used in default. Enter the slider’s Title & Alias. 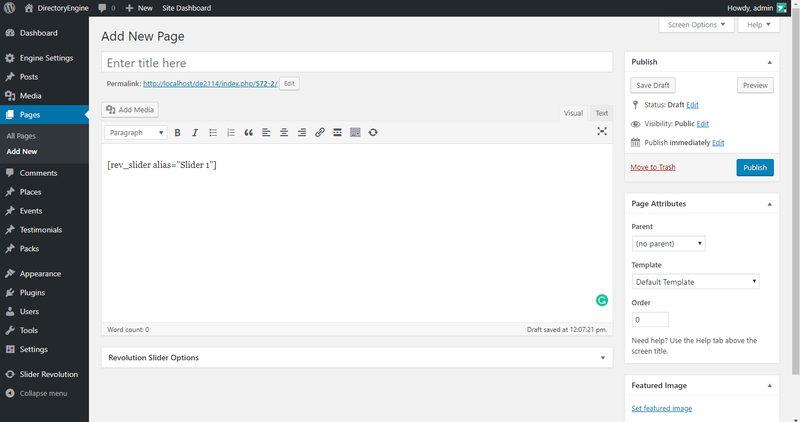 After the slider’s Title and Alias are defined, the ShortCode will be auto-generated. Copy & paste this shortcode into the content area of one of your site’s pages later. *Note: The slider “ Name” can be anything, but the “Alias” should not have any special characters or spaces (but dashes and underscores are ok). There are 3 types of sliders: Standard Slider, Hero Scene, and Carousel Slider. Select the suitable slider for your site, then click on the “Load a Present from this Slider Type” text link for further settings. 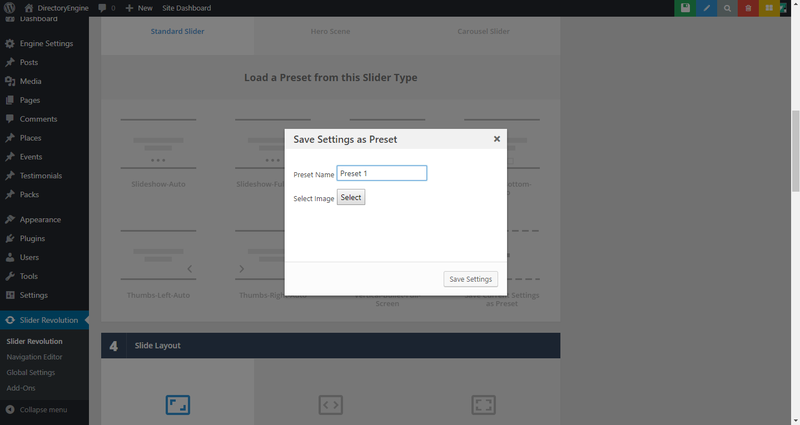 You can either load a settings preset template for your current slider or save the current settings as a preset template to be used for future sliders. There are 3 layouts that you can use for your site: Auto, Full-Widget, and Full-Screen. Select the most suitable one and complete its settings. Don’t forget to click “ Save Settings” at the left sidebar or on the top-right. Now, you will be redirected to the main page, you’ll find all the created sliders. If you want to change some settings, click Settings. 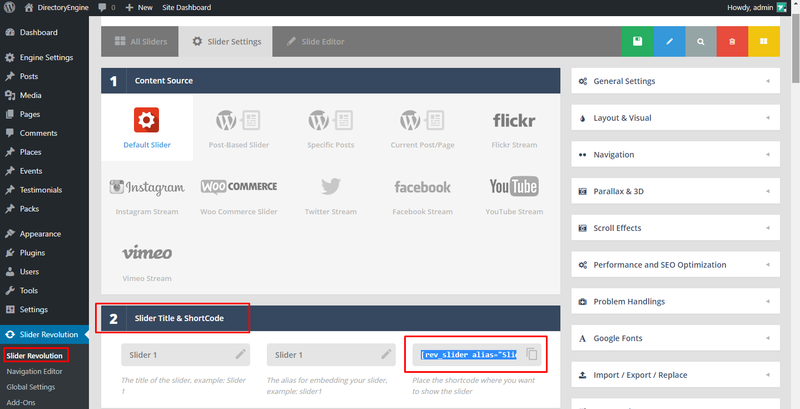 If there is nothing you want to change, choose Edit sliders to upload new images for your slider. Click New Slide to start adding slides. The source of the #1 slide in this section is transparent, so you can add new slide and delete it. Otherwise, you have to change its source into Main/Background Image and add a layer. Hover your mouse the “Add Slide” box. You can add a blank slide (new slide with default a settings) or bulk sliders (multiple-slides based on a selection of media gallery images of your choice). 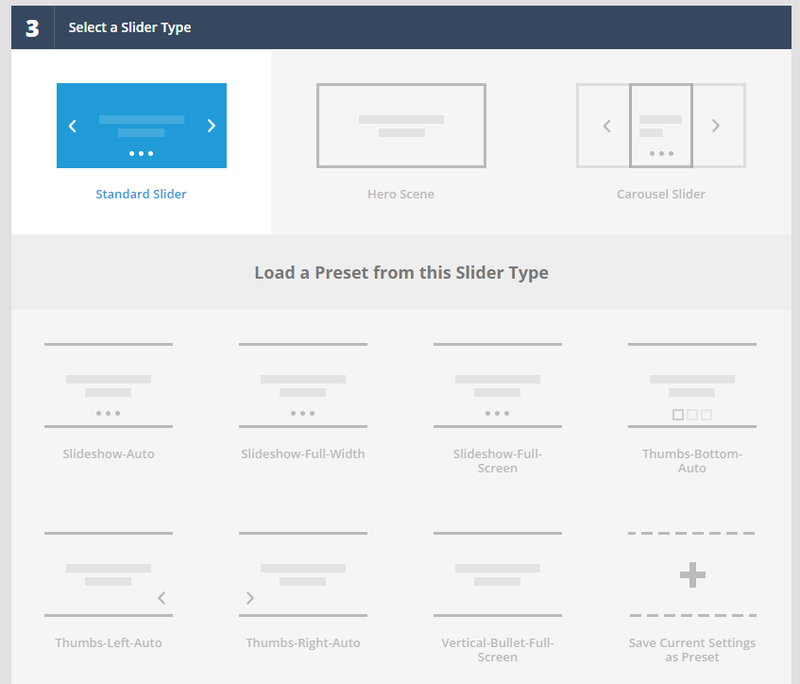 In FreelanceEngine, we recommend you to add bulk slides in this section. Select Add Bulk Sliders to add multi-sliders at once. After that, select images from your existing images in the media library or upload new ones. Don’t forget to delete the #1 slide. This section gives you in-depth settings for each slide such as main background, general settings, thumbnail, side animation, link & sea, slide info, and nav.overwrite. This section allows you style an individual slide; add new layer; change animation & loop, etc. Click “ Save Slide” after each slide to complete your settings. Before add the slider to your site, you should create new page ( Pages → Add New) or select an existing pages (Pages → All Pages). From the slider's main settings page, copy the slider's shortcode auto-generated in the “Slider Title & ShortCode” section. Paste this shortcode into your page's main content area. You will find the “Resolution Slider” from Appearance → Widgets. Drag and drop the "Revolution Slider" box into one of your theme's Widget Areas. Then, set up the widget options. *Note: You can also visit Revolution Slider main site (https://www.themepunch.com/) to check out their video guides.